DELTA collaborates with various on-campus partners. Pictured: group session from the Summer Shorts in Instructional Technologies program. DELTA team members began new collaborations with The Graduate School and the Office of Faculty Development (OFD) in 2017 in an ongoing effort to improve communication between on-campus organizations and to support students and faculty with additional teaching resources. Working with The Graduate School and OFD also falls in line with NC State’s strategic plan. Smith began holding workshops with OFD last spring, working closely with OFD’s Assistant Director Doug James and former Assistant Director Erin Robinson, covering topics such as creating and integrating rubrics into Moodle. “I always learn something new when interacting with DELTA staff,” said James. “I’m often fortunate to get in on the ground floor of discussions about using new instructional technology tools or other resources that can enhance teaching.” They lead workshops together once per semester. Their Spring 2018 workshop was on March 13 and covered competency-based grading. Another joint effort between OFD and DELTA led to the creation of the Faculty Interested in Teaching (FIT) group. FIT formed in Fall 2017 to generate discussion between faculty members about strategies or concerns related to teaching. Monthly meetings are facilitated by Smith and James covering a different topic each session. “As we plan events like FIT together, we strive to model the effective use of innovative teaching for faculty who participate,” said James. Their meeting on March 16 covered how to represent yourself professionally as an instructor, including campus interactions and using tools like LinkedIn and Twitter. Last fall, DELTA Instructional Technologist Christopher Beeson teamed up with Vanessa Doriott Anderson, the teaching and communication program director for The Graduate School, hosting workshops exclusively for graduate students and postdocs. The Graduate School is also home to the Office of Postdoctoral Affairs, which focuses on the needs of postdoctoral scholars. They realized some grad students and postdocs preferred attending workshops without their professors, prompting the creation of student and postdoc-only workshops. Four workshops are held each semester. Beeson added, “My job was to infuse technology with pedagogy. 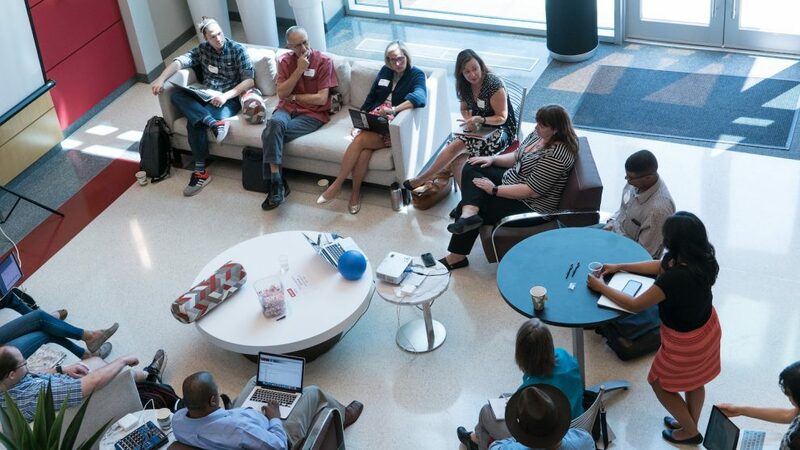 If you’re teaching face to face, then there’s likely to be an online component, because more than 91 percent of students experience a blended environment.” Beeson leads workshops teaching grad students how to use G Suite applications and Moodle. Smith also leads workshops covering rubrics and grading digitally. “We have a lot of graduate students who teach undergraduates,” said Smith. “I think that if we can help the graduate students use effective technology when they teach those courses that will drive innovation from the bottom up.” Smith says ultimately DELTA’s goal is to improve the student experience by enhancing the way graduate students and professors teach their courses. Another positive of having graduate students attend these workshops is the potential to spread awareness of DELTA services. “Students don’t really know what DELTA is which makes the collaboration important,” said Beeson. “It makes students aware of the other services DELTA offers aside from the Test Centers.” In August 2017, Beeson led a session at The Graduate School’s new teaching assistant (TA) workshop, a 450-person event which introduced future instructors to Moodle and DELTA programming. In addition to the grad student and postdoc-only workshops, Beeson co-teaches with Doriott Anderson as part of the Teaching and Communication Certificate program which formally launched in Fall 2017. “This is a new program that defines teaching broadly as the ability to communicate specialized material to non specialist audiences,” said Doriott Anderson. This flexible program consists of a series of workshops and development series which give grad students and postdocs opportunities to refine their teaching and communication skills through evidence-based, hands-on practice. 100 hours of approved activity, plus an online professional portfolio, are required for the program. DELTA’s workshops count toward the 100-hour requirement. By collaborating with DELTA, this program is accessible to a greater number of grad students and postdocs. Approximately 160 have registered since Fall 2017. Beeson and Doriott Anderson co-taught regular three-hour sessions during the fall semester. “They are all becoming content experts,” said Beeson. “But we would work with them on their presentation style, the pedagogy, how to teach, how to generate discussion, how to assess student learning and understanding, how not to rely on slides, etc..” Grad students and postdocs who successfully complete the program receive a formal transcript notation and leave the program with an online professional portfolio that represents their best work as teachers, researchers and communicators to potential employers in academia and beyond. Collaborations between DELTA and other on-campus organizations motivate a greater sense of collegiality at NC State. “It’s always great to get perspectives from other people on campus who do the same thing that you do,” said Smith. Smith added that another benefit of the collaborations is being able to share experiences and strategies involved with managing the unique challenges presented by NC State’s large campus. “Because this collaboration with DELTA and OFD has been so fruitful, we would like to use it as a model for future collaborations across campus,” said Doriott Anderson. DELTA will continue to expand its cooperative efforts with other NC State organizations to enhance student learning and faculty teaching resources.